Well - did you, last night? We did. I'm not sure why, though. Not sure we agreed with the decisions, either. And definitely not sure how many of the films are worth the hype. But we will be looking out the DVDs of An Education and The Hurt Locker. Avatar? ... I don't think so. We have a winner here too. A winner of the Brawn GP cap signed personally by Formula One World Champion Jenson Button. And it's not only Emma but The Royal Hallamshire Hospital who benefit today. Because in just over a week, thanks to your generous donations, the Neurosciences Department at The Royal Hallamshire is now richer by almost £100. Thank you so much to everyone who donated. And if you haven't had chance to donate and you would like to, the appeal is still running. You can read more about it here. And you can donate by visiting my JustGiving page. And it doesn't stop there. No-one goes away empty-handed. Because everyone who donated can now display a new award. 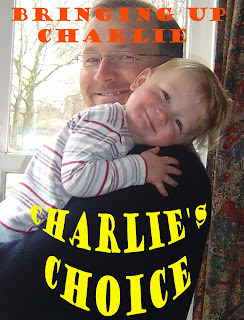 Forget the Baftas and the Oscars, and the Golden Globes.Because today we have a new award: the Charlie, or Charlie's choice to be precise. It is hereby bestowed on everyone who has so generously donated to this appeal. Here's the code you need to paste in on your blog. Display it with pride. Tell all your friends. There will be more. Just one favour, though. Please.... no rambling, tearful acceptance speech!